The Lower Elementary Cottage: Successful Saturday! 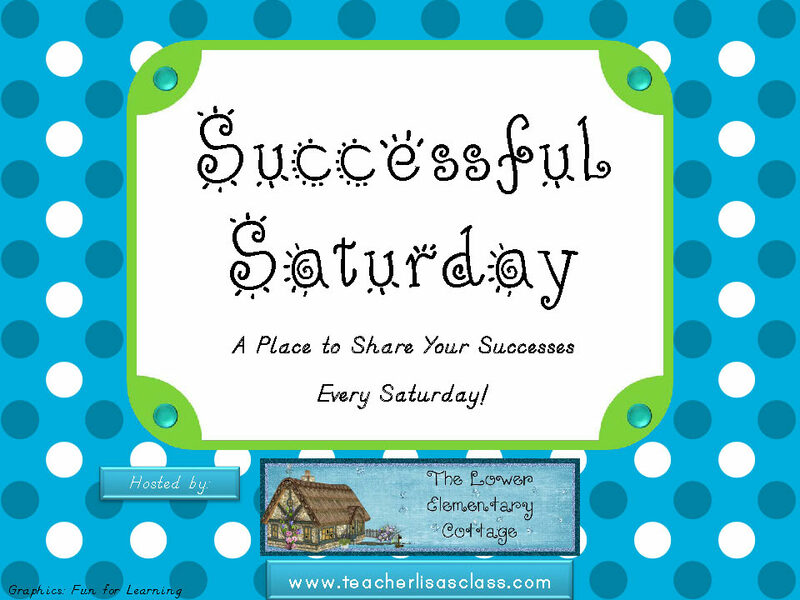 It's time for my Saturday Success story! Link up and share what was successful in your classroom this week! I feel like this week we had a bunch of tiny successes, not one big one. So you get a little mini story today! Take a minute to remember I teach kids with autism and other disabilities that often affect their social skills. As in they don't have any...at all. It's something I teach them like an academic subject. They can usually get it when we're in class, but trying to apply it the second they walk out the door to recess is a whole other story! This week I caught my kids playing together repeatedly! Whoo hoo! My class was outside and my friend (another SPED teacher) said, "Oh my gosh! Your kids look normal right now! They are playing like children at a normal school!" And I told her I was actually supposed to take them in earlier, but I wasn't about to stop the kids when they finally learned how to play like a normal kid. NEVER stop a good thing! I know there is probably a parent or SPED teacher completely offended right now by the fact that we were referring to the kids as "normal" for a moment which implies that they aren't "normal" but I'm being realistic here. I feel like 90% of the time is obvious on the playground that my kids aren't like typical children. I have them pretty well into a routine in class and they can often function fairly normally in structured class, but not so much during unstructured time such as recess. So I should probably explain what was so amazing that had us stopped in our tracks as we watched the kids. One boy asked for a soccer ball, and they actually don't ask for toys often. They tend to wander, stim, or talk to teachers. I handed it to one of the boys and the others all asked to join and play on the big kid section of the playground where the PE had left out the little goals for street hockey/soccer. As I watched the boys all took turns taking shots on the goal, used their feet and not their hands, stayed in the boundaries, and used problem solving skills when they began to argue over who's turn it was. IT WAS AMAZING!!! What was even more surprising was that this event did not happen for 2-3 minutes, it lasted for 15-20 minutes!! That is their longest sustained play without teacher interruption/guidance EVER!! Then the next day one kid asked for my sidewalk chalk. Once again, I said yes, because they never really ask for toys. I turn around and see 2 of them working together to draw a picture. As in the SAME picture, not side-by-side parallel play. Yippee!! During reading free time I caught two of my boys reading TOGETHER! Without being told to! Social skills success! !